You're invited to join the fun with The ACME Mystery Co. Buffalo for their next interactive mystery dinner theatre event: Deadly Inheritance! 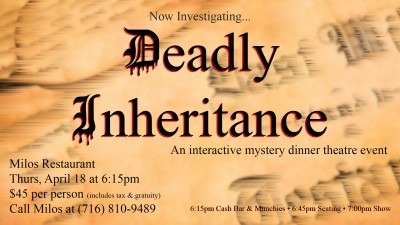 Guests will enjoy a delicious dinner, the show, and have a chance to solve a very real mystery. Some willing guests even get to play characters in the show!! Everyone has the opportunity to win prizes for being the best and worst crime-solvers! Reservations are highly encouraged so call (716) 810-9489 to make yours today. Tickets are $45 per person, which includes the show, 3-course dinner, tax, and gratuity. Cash bar. Cost: $45 includes show, dinner, tax & gratuity.